Ulster University Business School Business Institute is delighted to invite you to a one day conference entitled 'Perspectives on the creation and development of effective entrepreneurship ecosystems in Northern Ireland'. 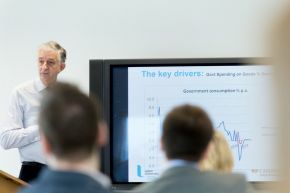 The Conference aim is to contribute to the development of the entrepreneurial capacity of Northern Ireland. It will seek to achieve this through the bringing together of key entrepreneurship stakeholders to examine ways in which the entrepreneurship ecosystem in Northern Ireland can be further developed.